Update: 5Feb18 I have now installed my show, here are some photos I took yesterday. 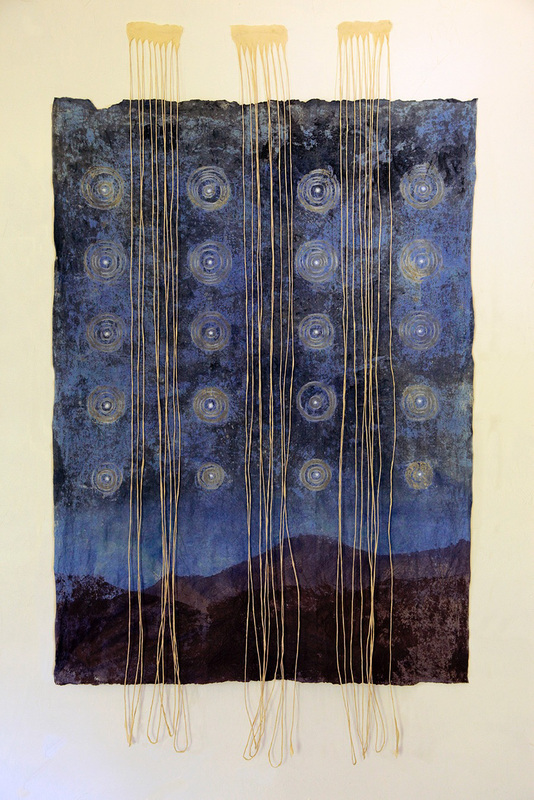 Catherine Nash (CN): My solo show and new installation, entitled “An Inner Astronomy”, is my response to the mysterious beauty of our physical sky and my reflections on an inner space that I catch glimpses of during quietude and contemplation. 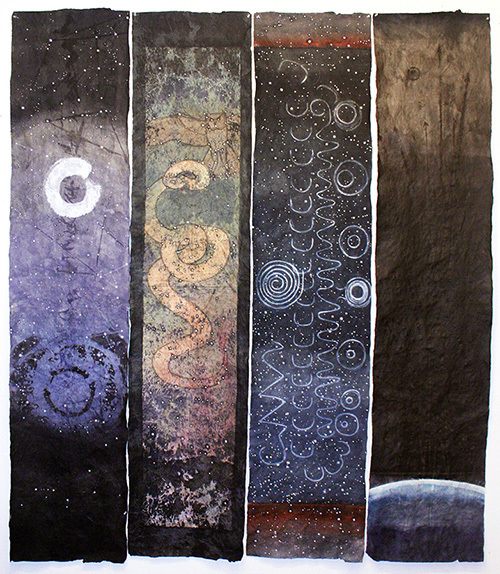 I am very drawn to the mystery of the night sky and it has inspired my art for some time now. My readings and research led me to study how varied cultures have explained the mystery of space and the planets and stars. 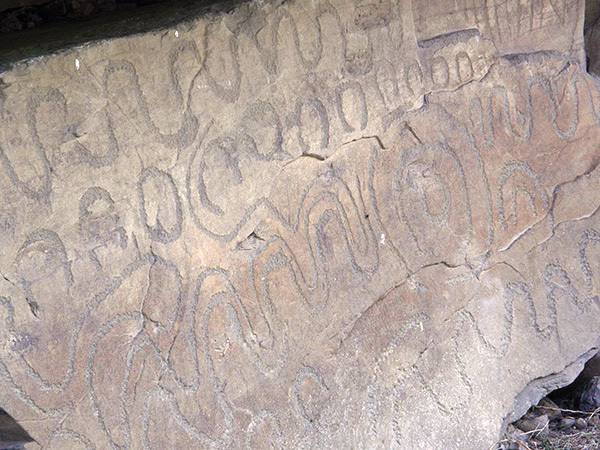 I discovered that there was such a thing as archeoastronomy - the study of how peoples in the past interpreted phenomena in the sky and how it influenced their mythology, music, art, and storytelling. TH: Can you describe your installation in more detail? CN: Of course, My intentions with this new work have been to “recreate” the laboratory of an imaginary scientist/artist. Twenty-one scrolls painted with different imagined celestial maps, constellations and grids are suspended in a curve on either side of the gallery and lead into a centralized work desk. 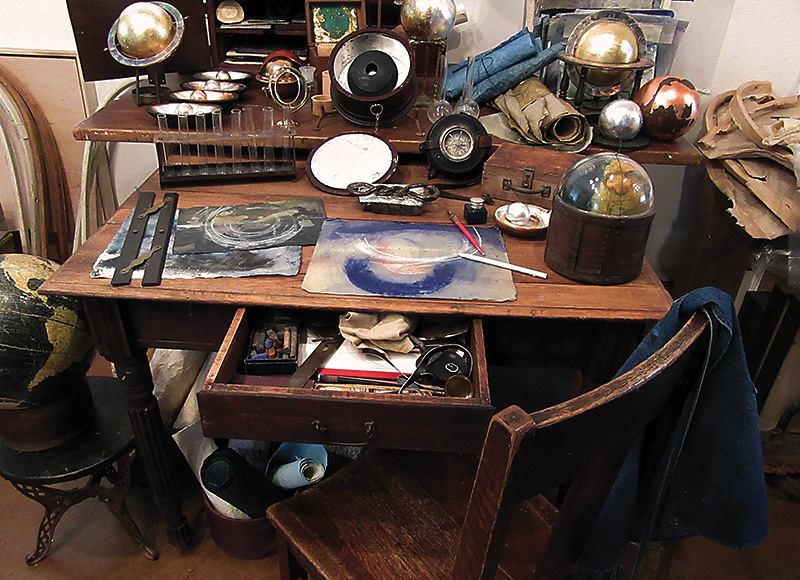 Gilded orbs and globes cover the desk in different states of completion. 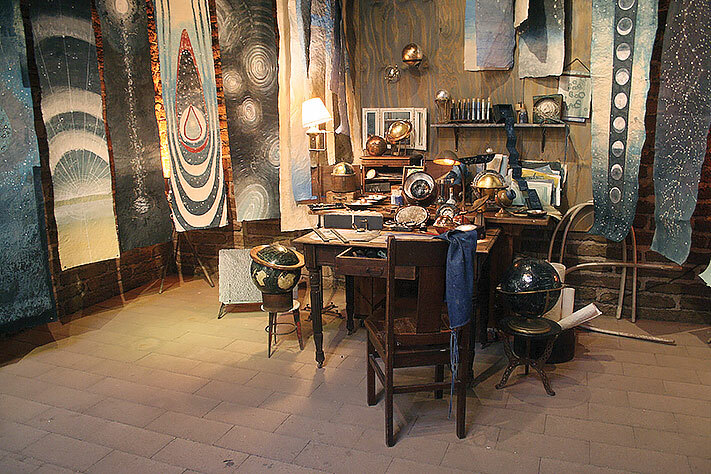 Sculptural works such as “Specimen” and “Sky Trap” sit on the antique wooden table. The drawer is filled with vintage art supplies and paper and tools of measure. More scrolls hang above the desk ready to be painted by the astronomer. The chair has a used work apron thrown over it as if the astronomer just left. TH: What emotional content do you feel is generated by this new work? CN: A sense of wonder and curiosity. My biggest influence is the awe that I feel at the mystery and immensity of space. My artist husband, Robert Renfrow, talks about “the presence of absence” in photography…and I love that concept: “that an image can have an implied presence, an indication that something was there at one point and is now gone.” There is evidence that the astronomer/artist had just been there. 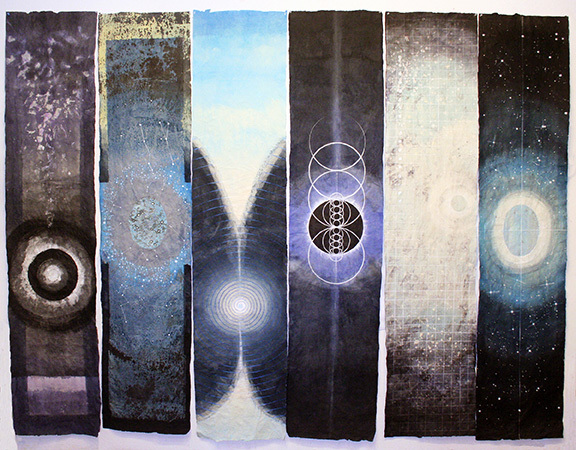 The persona of “the being” that has been creating these works is very present. I am hopeful that the viewer will project themselves into the shoes of the missing astronomer and embody a sense of wonder at our place in the universe. TH: Have you had experiences in nature under the night sky that have fed your creative muse? CN: Experiences are not hard to find in our beautiful, spacious desert, but one has to get out of the city’s light pollution to really see the night sky. I once participated in a special tour of artists up to Kitt Peak - as the day shifted into night, the light faded in slow gradation. The stars seemed incredibly close. On another occasion, the night before I was to hike down to Havasupai in the Grand Canyon, I lay down open air on the rocks. So mesmerized by the “turning” moonless sky, I barely slept. In the early ‘80s, while living in northern Arizona, I was invited to a Bean Dance within a kiva in the ancient community of Oraibi in the Hopi Nation. The dance eventually started long after midnight. Looking out over the mesa’s edge, the horizon dissolved into the sky, the full moon illuminated the timeless scenario and ancient landscape. These experiences have colored my soul and spirit. How can they help but influence my art? TH: Will you please discuss astronomy as a science and how it relates to your work? CN: If an astronomer comes to see this exhibition, they will only find a few direct references to astronomical imagery. Mostly this new work is imagined and in response to photographed phenomena and early drawings and writings by astronomers throughout the ages. 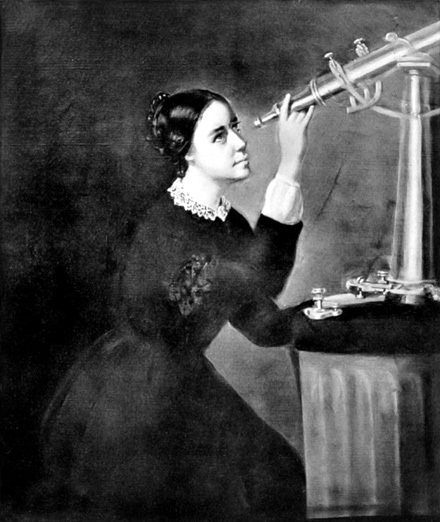 I will add though that I’ve been researching a specific historical figure in the astronomy world, Maria (pronounced Mariah) Mitchell who was the first American woman to ever work as a professional astronomer. In 1847, Mitchell won a coveted gold medal given by the King of Denmark for being the first to discover a comet through a telescope. Two summers ago, I visited the island of Nantucket, MA where she was born in 1818 and toured through her birth home and first observatory. I interviewed the undergraduate astronomers on their first day of their summer internship. Last summer, I had a private tour of the original observatory built to Maria Mitchell’s specifications on the campus of Vassar College in Poughkeepsie, NY, where she had been a professor of astronomy from 1865-1888. In Vassar’s Special Collections, it was amazing and an honor to see all the original glass plate negatives that Mitchell made with her students. Inspiring! 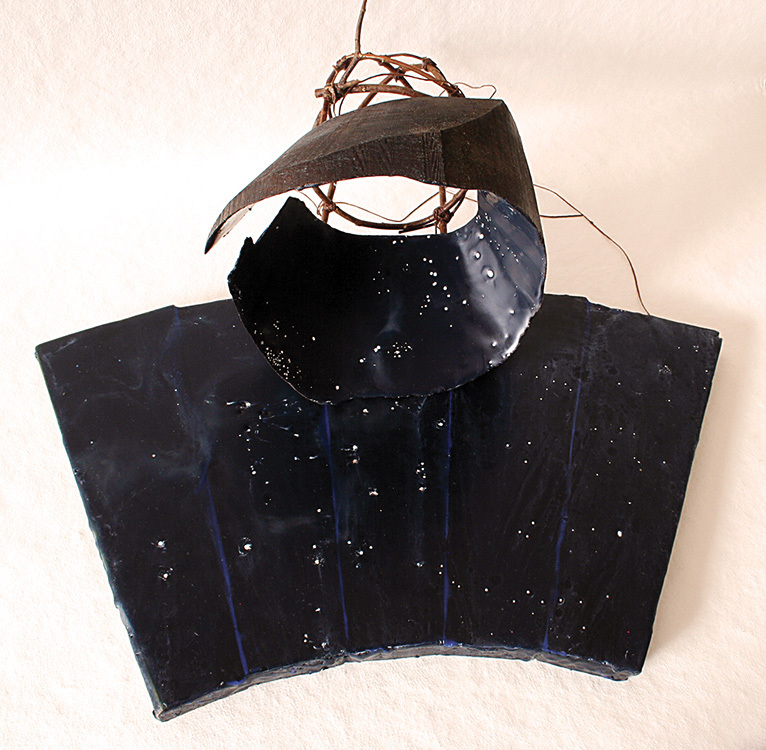 All of these experiences and research has influenced these new works and installation within “An Inner Astronomy”. TH: Is there anything else you’d like to add? CN: This new installation has never been fully installed before, so I am hopeful that you will add a photo after the show opens officially on Feb. 3rd! I’ve been working on components of it for three years and it is now finally coming to fruition. 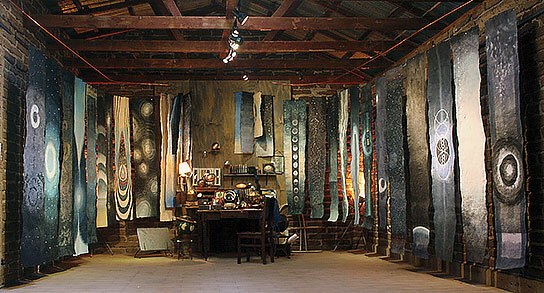 The Adobe Barn Gallery of Triangle L Ranch in Oracle is the perfect venue for this show. The rustic interior with its weathered beams and adobe walls lends itself perfectly to the vintage-inspired feeling I am hoping to achieve. When actually installing, I’ll be also responding to the space itself. I’ve been so grateful to the Ranch’s Sharon Holnback and Jim Pollack for giving me the artistic freedom to install my work in any way I choose. Triangle L Ranch is an amazing place (host to the epic GLOW happenings during the fall.) Besides the Adobe Barn Gallery, the Ranch is host to a B&B, a local arts gift shop and a wonderful sculpture park that trails through the rock-strewn desert in Oracle. The Gallery’s official hours are on Saturdays from 10-3, or by appointment by calling the Ranch at 520-623-6732. And, of course, there are two events for “An Inner Astronomy” - both an opening on Feb 10th and a closing reception on Mar. 18th, replete with telescope viewing of the night sky. Hope that you’ll make the trek to Oracle! Japanese kozo paper, konn’yaku, hakezome with pigmented inks, wax, drawing, shifu thread of kozo paper. The artist will talk about her work at ~3pm. 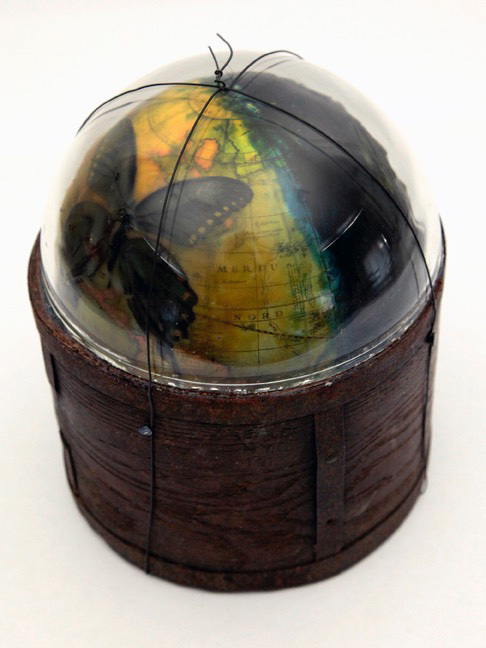 Closing Reception, Sunday March 18th, 5pm to 8pm. The artist will talk about her work at ~6pm.